Analysis and diagnosis of corruption. We follow the simple logic that before you can start addressing the problem you need to have a good understanding of what the problem is and what drives it. Reforms addressing land corruption. The core part of this review outlines different measure from published literature for tackling the problem of corruption in the land sector. We look at examples from different cities, regions and countries which have applied some of these measures and have made some level of progress in tackling the problem. Land is consistently ranked among the sectors where people most often report having to pay bribes to access services, according to Transparency International’s Global Corruption Barometer. The Land Portal has summarised the latest available (dated 2013) global data here, which shows that the incidence of bribes paid for land services can be over 50% in countries such as Cambodia, India and Pakistan. At the same time, implementing reforms in land management is one of the most challenging areas for a country or organisation’s anti-corruption programmes. The problem of corruption in the sector illustrates well the political challenges associated with bringing about change to strongly rooted societal structures as well the technical capacity needed to deliver reforms. Unambiguous political support and technical capability are often precisely the things that are lacking in the societies worst affected by this problem. The review primarily looks at the land sector in developing countries, where the problems tend to be most severe and the most guidance on curbing corruption issues is available. Corruption in the land sector is equally a problem in developed countries; it simply takes a less visible form. Developed countries can also provide some excellent examples of reforms implemented in practice. You will therefore find reform examples throughout the review covering both developed and developing countries. The originating author of this review is Tom Shipley, who is one of the editors of CurbingCorruption and is currently a PhD candidate at the Sussex Centre for the Study of Corruption. Additional contributions have been made by Mark Pyman. The Foreign Agricultural Organisation (FAO) and Transparency International (2011) have together produced the most comprehensive typology of corruption issues in land systems available currently. 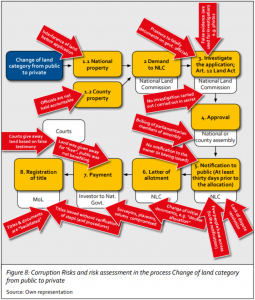 The diagram below is based on the DFID (2016) paper, which in turn is based on the 2011 FAO/TI typology, listing the specific forms of corruption in land governance. In collaboration with Transparency International, the Centre for Rural Development (CRE 2017) has developed a handbook on how to identify and map corruption risks in the land sector. This handbook is a useful resource. As shown in the table below, the authors propose a nine-step methodology, based around workshops which should bring together a diverse group of individuals with a stake in addressing the corruption issues. In the same handbook, the CRE apply this methodology to four cases in Kenya. An output from one of these case studies is shown below. One of the most visible ways in which political corruption in the land sector can manifest itself is in large-scale land acquisitions, often labelled ‘land grabs’, whether undertaken by domestic or external actors. This is a form of corruption in the sector which has received increased attention from campaigning and civil society groups and can also be thought of as a specific category of corruption risk. Data on large-scale land acquisitions can be found in the Land Matrix Global Observatory database (follow this link). One group of academics (Bujiko et al., 2016) have pulled together cross-country data on large-scale land acquisitions and shown there is a correlation between where these deals take place and countries with weak legal and institutional frameworks. The work suggests some investors target countries which are more vulnerable to improper forms of influence, but that this can be countered by institutional development. The risks around each of these phases are discussed in detail. The forms of corruption might entail bribery by an investor, collusion between officials and investors or outright expropriation of land, commonly to the detriment of less powerful groups. Here on the right is a brief country case study taken from the report. The report includes recommendations to address this specific category of risk, which in the case of external investment involves coordination of domestic and international measures. We include these recommendations in our section on interventions (you can jump there by following this link). There are multiple drivers of corruption in land administrative systems. These include unclear or contradictory legal frameworks; complex and lengthy bureaucratic processes for basic services involving multiple agencies in government; inadequately resourced agencies and poorly paid staff; a lack of transparency around citizen rights; and, shaping all these factors, political interests which work against an overhaul of the system (U4, 2016). A sound analysis of the political economy of a land sector provides a strong grounding to understanding the types of corruption issues present. Political economy analysis is: ‘concerned with the interaction of political and economic processes in a society: the distribution of power and wealth between different groups and individuals, and the processes that create, sustain and transform these relationships over time’ (OECD-DAC definition quoted in DFID, 2009). The role of assets that actors use and accumulate in furthering their interests and underpinning their agency, ranging from economic assets to social and political capital. What this comes down to is building a picture of the forces at work which are likely to help or stand in the way of measures to address corruption. These are also critical points to consider in developing an overarching strategy for reform in the sector. Who benefits from the status quo and who is excluded? Who sets the agenda for reform? How do others influence this agenda? What are the interests and objectives of different stakeholders and how do these play out in the reform process? Why do reforms experience slippage during implementation? How are the benefits of the reform distributed? Who benefits; who does not and why? As an example, the FAO looks at the benefits of analysing formal and informal land markets from a political economy perspective. It looks at what you can learn about how markets function (and how they don’t) by understanding the range of land rights that exist and the types of people involved in acquisitions and sales processes: ‘by tracing the flow of payments for different services and by examining how these are factored into prices, formal – and in particular informal – markets can say a lot about power relationships and the political economy of land’. The same publication includes a template for capturing points from the analysis which could be adapted for your purposes. The key point is that politics shapes the forms of corruption you will encounter and how amenable these issues are to reform. This may be most visible at the administrative level if land systems have been designed as a means of illicitly capturing rents by political elites. As an illustration of this point, we would recommend a 2017 paper by Paul and Matthew Caruana-Galizia on political corruption in Malta. They argue that political actors have created ‘institutions as rent-collection instruments – not to correct market failures, but to create opportunities for corruption’. In a small country where land is at a premium, they show that restrictive zoning laws and a de jure independent regulator have ‘created opportunities for extensive and endemic corruption in the granting of land development permits in zones that are outside development’. Your analysis may lead you to conclude that what is needed are changes to the legal and policy framework in the sector. Clarity in land policy and regulation provides a strong basis to other reforms. It may be that establishing or amending the framework is not absolutely focussed on rules around corruption – although it certainly can and should be explicit about the issue – but seeks to improve governance in the sector more generally. The benefits for tackling corruption are that by minimising any ambiguity around rules and rights, there is less opportunity for these to be exploited by corrupt actors. Recognition of land rights: clearing defining and identifying land rights, including customary or other types of group rights, to improve tenure security. This adds to the protection available for vulnerable groups in terms of countering claims from more powerful actors who might use corruption to contest the rights of individuals or groups. Enforcement of land rights: legal recognition of rights is to be backed by the ability of right holders to unambiguously identify land boundaries and call upon external agencies to enforce rules. Mechanisms for recognition of rights: systematic registration of land rights (see more on this below) with transparency around the processes and criteria used to decide between competing rights. Restriction on rights: the careful consideration of limits which can be placed on the types of rights exercised by individual rights holders with a view to achieving for example appropriate environmental management. Clarity of institutional mandates: having a clear delineation of the different roles to be exercised by the institutions involved in the management of the sector. This reduces the influence of informal or parallel institutions which might have developed, and which are more open to corrupt interference. 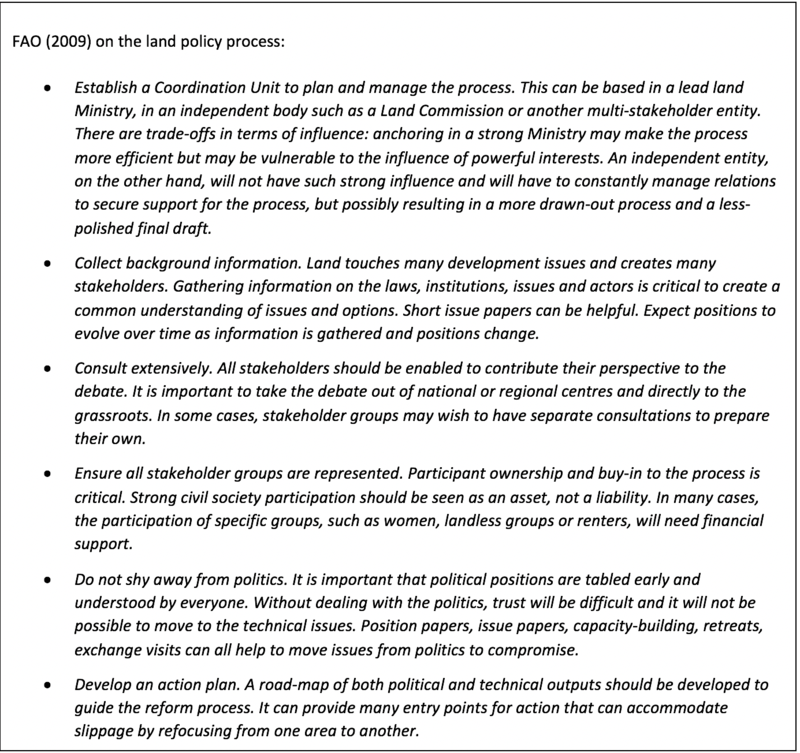 Detailed implementation guidance along with country examples can be found at the World Bank’s land governance site. Does the legal and policy framework explicitly prohibit corruption in land processes and transactions? 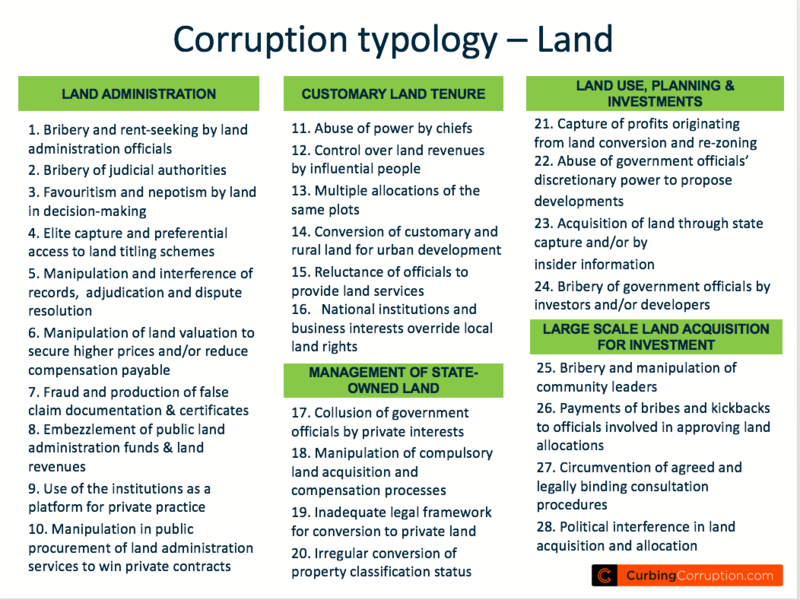 Is corruption broadly defined to encompass the different forms it might take in the land sector e.g. bribery, misuse of state assets, embezzlement, conflicts of interest, influence peddling etc.? What role should anti-corruption agencies have in investigating abuses of the legal framework? Where do citizens raise complaints about corruption? Which agencies are responsible for monitoring land transactions for indications of corruption? Opportunities for corruption arise around the processes of planning how land will be distributed and developed. This is an important aspect on which to focus reform as the value of land can be dramatically altered by the decisions taken by a limited number of state officials, creating the potential for corrupt interference. For instance, in many cities globally, the conversion of land from agriculture to industrial use, where more limited space is available for the latter, adds significantly to the monetary value of the land, creating an incentive for corrupt behaviour. 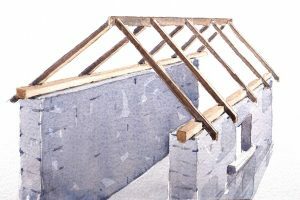 Auction of development rights: a public auction of development rights to provide a ‘healthy and open platform; on which landowners and developers can compete for the quotas available. This does not necessarily eliminate the problem of corruption as land-use must still be determined and auctions can be manipulated; however, it is a more open process than direct negotiation with companies. An auctioning system has been used as an explicit means of addressing corruption in transactions in Hong Kong. In the Hong Kong case, auctions are held of publicly-owned land through which developers obtain new developable land by buying it or leasing it for long periods of time (60-99 years); the winner is the developer that submits the highest bid, usually conditional on it being above the ‘reserve’ price set by the public administration (Chiodelli & Moroni 2015). Betterment capture: the authors define this as the ‘retrieval of the windfalls’ of particular lots due to land-use choices. By exercising a betterment levy on land rent, the differentiated treatment of landowners is minimised, and the incentive to capture the economic benefits from changes is reduced. Examples of the application of these measures in different countries and further debates on their pros and cons are included in the article. Country assessment reports published under the World Bank Land Governance Framework (available here) are a rich source of information for how different countries have gone about reforms. You might look for useful examples from countries in your immediate region or alternatively pick a particular indicator and make a cross-selection of countries to see how they manage this issue. We provide here a couple of examples below taken from Peru, as analysed by the World Bank (2012) in their own study of good practice. These are relevant to two key areas of corruption issues: the management of state-owned land and the organisation of public land registries. Again, the examples show that problems still remain, but some positive steps have been made. ‘Proinversión is Peru’s national investment promotion agency which assists decentralized levels of governments in attracting investments. The mechanism used to divest public lands for investment projects depends on whether projects are initiated by the government or at the initiative of an investor. If a government agency (ministry, regional or local government) has identified the desirability of carrying out a given project, it will request Proinversión to start promoting the project. Proinversión will initiate a process of regularization of any land rights to determine the nature of pre-existing claims that may need to be respected or cleared, and the type of land rights that can be granted to the private investor. If illegitimate claims existed, they are cleared. If legitimate pre-existing claims existed, they are treated following the rules for expropriation and compensation. The technical defects of the title are also cleaned (for instance if a track of public land is dispersed in several records with poor descriptions, rectifications in the property registry will be made). The intention of divesting the land is then published in the official gazette, local and international newspapers and a government website. The terms of bidding (i.e. minimum investment required and minimum bid price for the land) are published for a minimum of 90 days (longer if the project is more complex). Before accepting any bids, bidders must prequalify by proving liquid assets to cover at least 60% of the minimum bid price and intended amount of investment on the land. For prequalified bidders, bids are assessed and ranked by offered price and the amount of projected investment. Monetary offers are then presented, and a winner is declared. Before the signature of the contract, the land has to be paid and a letter of credit covering the amount of the proposed investment is deposited with the Government. If projects involving the divestiture of public land are at the initiative of private investors, a similar process is followed. In this case, the potential investor has to present a detailed business plan that details the amount of proposed investment and price for the land before a board composed of public and private sector specialists, including the responsible line ministries, especially the Ministry of Agriculture if irrigation is involved. If the proposed project is considered viable and not in conflict with existing regulations, the proposal is published for a minimum of 90 days to allow other potential investors to offer to carry out the project. If any investor comes forward, a public bidding process as described above will be initiated. If, during the 90-day publication period nobody has shown interest in the project, the investor is allowed to proceed as originally proposed’. The Property Registry (Registro de Predios) is part of the national public registry system. Since its establishment in 1994, the superintendency of public registries made good progress in introducing technology and improving customer service. This helped to eliminate petty corruption, professionalize staff who are now trained on a regular basis, automate registration processes and cut delivery times through online service. However, users still find registration procedures slow and unpredictable. The system provides for the protection of registrars from political pressure by granting them autonomy in their decisions. However, the application of this principle along with the lack of standardized requirements results in discretionary interpretation of laws. It is exacerbated by understaffing of city registration offices and the complexity of regulations governing transactions that are dispersed among the Civil Code and other non-standardized and frequently changing laws, decrees and regulations. Coordination with other institutions remains weak and no standardized cadastral information is shared with other institutions. Land agencies are at the centre of management of the sector and are often a focus of anti-corruption reforms. Development of a well-functioning land agency can have multiplying effects in terms of better governance of the sector as whole. In their ideal form land agencies should provide ‘efficient and accessible land registration services, transparent land information, and clear ownership records to prevent disputes’, ensuring an accurate record of property rights (Innovations for Successful Societies, 2018). Like many public bodies, however, the process of reform can be challenging when there is a long history of mismanagement and poor practice is deeply rooted in an agency. The Innovations for Successful Societies programme (2018) has reviewed five examples of transformation of land agencies. Their study provides valuable indicators for how an agency can make a critical break from a state where corruption is highly prevalent. One of the main lessons from the review is the benefits which stem from establishing largely autonomous, self-sustaining agencies. In some of the examples discussed, such as in Rwanda (see the country section for more detail), the agencies succeeded in generating the own revenue streams from service provision. This loosened their operational dependence on other government ministries or departments and ‘freed managers from the need to negotiate with senior officials in other ministries for a share of any resources that remained’. Critically, (and bearing in the mind the political economic dimensions to reform), this is a measure which didn’t meet with large opposition from within government due to the fact that it no longer had to provide resources to the agency. Functions: bringing together the major functions of land administration into a single agency can improve efficiency, information sharing and reduce costs. Devising a monitoring framework for the agency with clear indicators, such as transaction numbers or turnaround time, can improve efficiency. This could be supervised by the ministry responsible for the sector as a whole. Land agencies should have a voice in policymaking but should maintain distance. For example, the setting of fees by elected government helps support legitimacy. In contrast, conflicts of interest can arise if an agency has control over zoning and approval of changes in land use as there are financial incentives to maximise transaction volumes. Data sharing: Different government agencies benefited from a clear data sharing policy. New products: The merger of agencies enabled innovative products to be developed which could be turned into new services. Integrity: The report highlights in particular that tightening record security limited opportunities for fraud. Transparency around fees and service standards also helped prevent bribery. The Innovations for Successful Societies programme (2018) gives the following example from Jamaica of the transformation of a land agency, noting that the process of reform is ongoing. ‘In 2001, registering or transferring land in Jamaica was an uphill battle. Four separate departments handled different aspects of land administration, leading to weak coordination and delay. Even straightforward transactions dragged on for weeks, simply getting information was a struggle, and fraud was commonplace. In April of that year, Jamaica established the National Land Agency, charged with merging the four departments, speeding up services, and improving their quality. As the new agency’s CEO, Elizabeth Stair led a team of managers that had to oversee the consolidation, design systems to prevent fraud, improve performance, and implement new procedures and technologies to increase speed and transparency. The CEO signed a performance contract with the minister and had to provide quarterly and annual progress reports, and if the agency failed to meet its targets, the CEO could be dismissed. Although the NLA did not directly manage Jamaica’s land titling program until 2017, it collaborated on information sessions and mobile one-stop shops for registration. During its first decade and a half of operation, the National Land Agency significantly reduced processing times and won acclaim for its customer service and innovative use of technology. Despite these successes, there was still room to improve land tenure security. Stiff documentation requirements, high costs, and limited awareness of the process meant that registration and related services remained out of reach for many Jamaicans’. The province of Western Australia provides an example from a developed country of transformation of a land registry. Again, the Innovations for Successful Societies programme has provided a case study of this transformation, covering the period from 2007 to 2017. In this case, the state government created a statutory authority, known as ‘Landgate’, which although abiding by civil service rules, was an institution with some private sector characteristics. One notable feature was that the agency retained revenues generated and had more autonomy in setting its fee structures. This created some flexibility in servicing high demand from the local property market. It also supported the long-term sustainability of the agency and improved its service delivery. Mapping of land titles: countries have used satellite technology to assist in mapping land title for the recording of land rights. This can assist in solving disputes regarding land boundaries and conflicting claims to titles, while improving the quality of information available for the sector more generally. This is also a process which can be coordinated with legal and policy reform to improve protection of land rights. Introduction of technology into land administrative processes: e-government measures can be used for procedures such as legal searches, title applications, recertification of titles, payment of registry fees, tracking of applications etc. This often also entails a simplification of procedures, less interaction between citizens and agency staff, and a reduction in the number of steps and departments involved in land transaction processes. Two examples from Nigeria and Rwanda on the application of technology are included in the country reform section, see below. Abuja is an example of a capital city which has adopted e-government measures with the aim of reducing corruption in land administrative services. Akingbade et al. (2012) have undertaken a review of the Abuja geographic information systems (AGIS) project, which began in 2003, and involved the computerisation of processes in the Federal Capital Territory in Nigeria. The services computerised included the granting of statutory rights of occupancy, area councils’ title regularisation, recertification of plots using a geo-database, legal searches, consents to alienate and planning and survey data. Based on interviews with key informants and survey results, the authors conclude that computerisation had an impact in terms of reducing certain types of administrative corruption, such as small bribe payments and incidents of fraud; however, the system could not help to combat issues such as nepotism and favouritism, which continued to be exercised behind the scenes. The table below summarises the outcomes of the intervention. As described in a case study prepared by the Innovations for Successful Societies programme (2017), Rwanda is an example of a country which has completed a nationwide land mapping exercise. Over the course of four-years from 2004 – 2008, the country mapped 10.4m land parcels and prepared title documents for 8m landholders. One of the main motivations for the project was to establish greater certainty of tenure for citizens in a country where pressure around available land was one of the major drivers of civil conflict. In terms of the practical challenges of implementing such a large-scale project, there was an initial lack of public awareness and understanding around the titling system, which meant that by 2012 only one in eight individuals had picked up their official titles. This led the land authorities to simplify the procedures and registration forms while undertaking a national awareness campaign, increasing the figure for collection of titles to 7 million people. The case study does not explicitly discuss the impact of the project in terms of reducing corruption but is nevertheless valuable in outlining how the authorities adapted to the practical challenges of the programme and ultimately improved service provision to citizens. There is reason for caution, however, in viewing technology as an all-encompassing solution to the problem of corruption in the land sector. Many of these measures entail a high degree of finance and resource, which requires judgement to determine if this is the most effective means of achieving the goals of the reform programme (insert link to strategy section). Furthermore, the introduction of technology does not make the political aspects around management of the sector redundant nor does it mean that processes can’t be subverted. It does though make this significantly more difficult which is why agencies commonly opt to pursue this type of reform. Using general (where the position has not been precisely determined) rather than fixed boundaries (where the position has been accurately recorded). They argue the former is sufficient for most rural and semi-urban areas and allows for more interoperability between land systems. Using aerial imageries taken from satellite imagery rather than field surveys which they estimate to be around three times costlier in rural areas and five times costlier in urban areas. Ensuring that accuracy is for a specific purpose rather than purely to meet technical standards i.e. technical standards can be inflexible whereas mapping should concentrate on provided the information which is truly needed. Look at opportunities for updating, upgrading and improvement of equipment – they note that building a spatial framework through mapping is not a one-off process, but is a continuous process of incremental improvement to ensure the completeness and reliability of data. The state of Karnataka in southern India is another example of a region where e-services are viewed as having had a positive impact in terms of reducing corruption in the land sector. Bhatnagar, S. and Chawla, R. (2004) have studied the effects of a project to deliver online land titles to rural farmers in the state. Beginning in 1991, the process of computerising land records took over ten years, culminating in the production of 20m records of land ownership for 6.7m farmers in the state. The state had previously used a manual system in which around 9,000 village accountants maintained the records. These records were not open to public scrutiny and bribery was commonplace: according to the article, bribes typically ranged from $2 – 40 to obtain services from the accountant. It could also take one or two years for records to be formally updated. After the project, records could be obtained online at a cost of $0.32 at 177 land record kiosks throughout the state. Requests are provided on a first-come, first-served basis, reducing discretion and favouritism, with officials also held accountable for their actions through an electronic log of transactions. An evaluation by the Public Affairs Council in Bangalore in July 2002 found that e-government had a significant impact in terms of efficiency and reducing corruption. 66% of citizens reported having to pay a bribe when the manual system was in a use. This figure was reduced to 3% after the introduction of e-government. Other benefits of the project included reduction in the complexity of procedures: 79% of users were now able to complete a basic land transactional process by meeting only one staff member at the counter whereas in the previous system 61% of users had to meet up to four users. There was further a significant reduction in the errors made with records. Implementing such a large-scale project was not without its challenges. The article discusses problems in implementation associated with, among other things, having to put in place kiosks in remote rural areas, illiterate farmers struggled in completing forms and the poor-quality crop survey data. This was also a project which consumed a significant amount of resources and cost. The project evaluators consider however that the advantages in terms of the efficiency of the service and the improved responsiveness for citizens justified these costs. While technology is becoming increasing important, management of the sector is still ultimately about people. Focussing on building staff integrity in key agencies involved in land transactions is another important area for reform. Codes of conduct and professional ethics are common in many sectors and can equally have value in the land sector. There is a gradual move away from codes which are largely rule-based to creating an environment in institutions where officials can exercise judgement within certain ethical parameters. Positive incentives are more likely to lead to a more sustained change in behaviour than discipline-focussed measures (for general background on codes of conduct and ethics see U4, 2009). At the same time, there need to be clear disciplinary penalties for officials who cross ethical lines and knowledge that there will be repercussions for involvement in corruption. Citizens need an outlet to raise concerns around abuses in the sector and to enable the authorities to identify and respond to allegations of corruption. There seem to be two main paths which reformers could take in establishing such a mechanism: 1) relying on existing state institutions, such as the office of ombudsman or the judicial system, to hear complaints 2) establishing a specific committee or unit within the land administration authority. Both options have their pros and cons. In the former, there is a degree of separation from the land administrative authorities which might improve the independence of the mechanism. Nevertheless, in many countries where corruption is pervasive, the integrity of the court system and its capacity to respond in a timely manner to complaints cannot be assured. In the second option, there is the advantage that a specific sector unit is more likely to have the expertise to appropriately adjudicate complaints and there is more freedom for reformers to devote the resources needed for it to be effective. On the other hand, the degree of direct control from a land ministry or similar body may compromise the work of the mechanism and lead to distrust among citizens. The best solution will depend on the circumstances of your sector and the strength of the existing mechanism and capabilities available. The key point is that a grievance procedure is perceived as legitimate and is accessible to all citizens. Transparency International (2018) provides the following additional recommendations regarding the accessibility of such a mechanism: ‘Independently of their form and channels for handling complaints, these mechanisms should be transparent, independent, accountable, accessible, safe and easy to use. It is also important to make them accessible to marginalised populations, for example, by adapting to the local context, considering cultural norms and values, level of literacy, phone coverage and social patterns, among other aspects. To elaborate appropriate culturally sensitive and context-specific responses, beneficiaries should be consulted in the design of the complaints mechanism’. We include the following example of the establishment of a grievance mechanism from Lahore, Pakistan’s second most populous city. In this case the mechanism was established within the land registry service and led to increased reporting of corruption allegations. 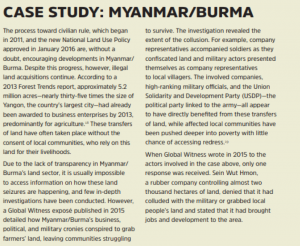 The case is cited in Transparency International’s land topic guide (2018). Sometimes major change in a sector can only begin when the scale of the problem or the most egregious abuses are laid bare to the public. A well-researched investigative story can mobilise and bring together supporters for reform. The land sector in particular can benefit from investigative journalism as many of the abuses may be out of the public eye and affect vulnerable communities which do not have the means to make their voices heard. For those working in this area, we would recommend a training manual for journalists prepared by Transparency International (2017) which focuses specifically on investigations in the land sector. The manual covers methodologies for investigation, case studies and different resources for research, structured over a three-day training course. The manual primarily speaks to the problem in sub-Saharan Africa, but the principles behind the investigative methodology presented could be applied elsewhere. Some further tips and examples can be found in Transparency International’s resource book of women, corruption and land (2018, b.). The publication points to different forms of media, such as digital platforms for reporting corruption, participatory video and community radio, which can serve to highlight the harmful consequences of corruption in the land sector for women’s livelihoods. Examples of investigations and projects undertaken by women are available throughout this resource book. 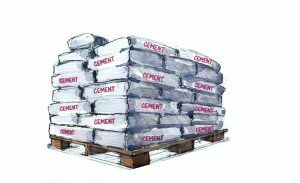 Make sure your own house is in order: There are few businesses whose activities do not require some level of involvement in the land sector, even if this may be at a varying scale. Companies should have in place a compliance programme, which covers corporate leadership against corruption, risk assessment, standards and controls across the company, training and communication initiatives and oversight mechanisms. Risks stemming from land transactions should be captured in the company’s risk assessment mechanisms as a specific area warranting attention with appropriate mitigation measures to be taken. Companies should for example conduct due diligence on agents and partners in land transactions and ensure they understand the costs and service deliverables which can be expected from a government agency. Corruption issues can often stem from time pressure around commercial transactions and, as such, companies should build time into their strategies for delays associated with working through the formal bureaucratic process. More detailed information on compliance programmes can be found in our review of the private sector (click here). In some jurisdictions it has become mandatory for some or all companies to have a compliance programme. This could be something to consider for companies involved in certain types of transactions in the land sector. Collaborate with government on reform: Companies can actively contribute to reform initiatives in the land sector. Some of the measures described in this section, such as reforming the legal code and the reform of development and planning measures, offer up opportunities for companies to positively contribute to how the sector is managed. This can help ensure predictability in land transactions which should be to the benefit of all participants in the sector. Be transparent in your business dealings: Companies should publicly disclose information regarding activities and transactions in the sector as a means of building confidence in the operations of the private sector. A publication on land by the Global Reporting Initiative (2016) is a useful place to start in considering what types of information to publish, as is the Tainted Lands publication discussed immediately below. 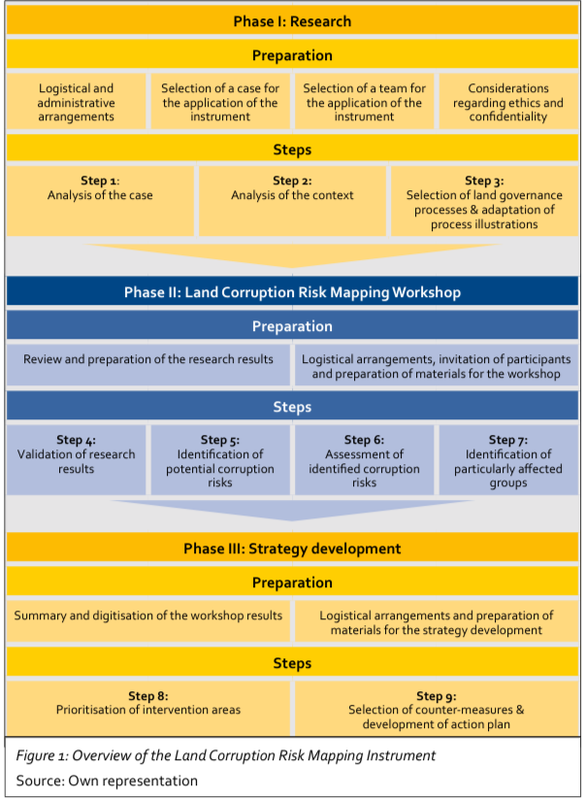 Bringing together many of the anti-corruption interventions described so far in this review are the particular corruption issues stemming from large-scale land acquisitions, sometimes called ‘land grabbing’. As large-scale acquisitions often involve external companies and investors, anti-corruption measures need to have sufficient reach to be able to influence corporate behaviour. This may therefore entail a combination of domestic measures as well as supervision in the home countries of companies and/or their investors. The emphasis should be on encouraging responsible investment through appropriate due diligence and transparency around investments made with clear penalties for non-compliance. Countries have sometimes found it effective to work with other governments and regulators if their domestic enforcement mechanisms are weaker. The International Corporate Accountability Roundtable and Global Witness report (2016) previously cited, Tainted Lands, presents a number of recommendations which cover the different actors involved in these processes. These recommendations are grouped according to their different target audiences and are summarised below for reference. Undertaking a political economy analysis of the land sector to better understand what types of reform are likely to be feasible. Mitigate the negative impact that donor projects, such as liberalisation of the land market, urban development, infrastructure projects and refugee resettlement, can have in terms of sustaining power structures and creating opportunities for corruption. Increase transparency and the dissemination of information around land administration. U4 (2013) provide an example from Vietnam where donors created a report investigating whether local governments were providing information (which they were legally required to publish) to citizens. Enforce standards of business integrity in their own companies and financial institutions investing internationally in the land sector. The possibility of an international land transparency initiative, similar in scope to existing industry initiatives such as the Extractive Industries Transparency Initiative (EITI), the Construction Sector Transparency Initiative (CoST) or the Making the Forest Sector Transparent (MFST) programme, has been previously considered for the land sector but to date has not been launched. These initiatives work on the basis of voluntary participation by countries who commit to ensuring certain standards of transparency of data relating to the governance and management of the sector. Existing initiatives have been praised for promoting and consolidating norms of transparency in sectors often thought resistant to open practices. However, it is important to acknowledge their limits in the sense that transparency does not guarantee better practice in the absence of good quality information and the capability to scrutinise it. Whether these initiatives can drive actual changes in behaviour and lower corruption is a matter which is more open to debate. Transparency should not be an objective in itself but a means to an end. The report’s authors consider for example how a transparency initiative could contribute to achieving goals on land tenure conditions and procedures, and of land governance more broadly. Clear indicators of success and a monitoring system need to be established from the start, with in-built flexibility to adapt these as needed. Time is needed to allow meaningful consultation and participation on the form the initiative should take. A clear institutional structure for the initiative would need to be set up with distinct roles and mandates at international and national levels. Discussion on an international measure appears to have stalled. It is certainly a measure which merits further debate and there is a potential coordinating role here for donors concerned about these issues. However, other than the reform examples quoted above and the case below, we have not been able to find any examples of sector-wide strategies for land reform. Example: Georgia and radical transformation strategy. This text is taken from the FAO (2009) and provides an example of radical organisational transformation in Georgia. But, a caution: though this is a ‘good’ reform, all reforms can be reversed, and there has been significant resumption of corruption Georgia since the early phases of the reforms. The main lessons can be seen in the enhanced autonomy of the agency and staff behavioural changes driven by improved recruitment and human resource practices. ‘The Georgian agency responsible for land registration had inherited a large bureaucracy of people who were poorly paid and many lacked motivation. People wanting to register transactions were required to pay bribes. Following the “Rose Revolution” of 2003, Georgia took the opportunity to transform the registration agency into a self-financing agency under the Ministry of Justice. The new agency was put at arms-length from its parent Ministry, giving it greater autonomy in decision-making, but leaving the Ministry responsible for budget oversight and the approval of the head of the agency. The number of posts was reduced from 2,100 to about 600. A new recruitment process was introduced in order to ensure that people in the agency had the required skills. New job descriptions were created, and an open competition with qualifying examinations was held to select personnel for the new structure. Staff cuts were complemented by capacity-building for retained staff and improved wages. The average monthly salary increased from 57 lari (about USD27) in 2004 to about USD450 in 2006. The increased salaries for retained staff were funded in part by reducing the number of staff, and in part by revising the registration fees. In effect, the bribes that people had paid to register transactions were “formalized” and included within the published fee schedule. As a result of the reform, the budget of the agency increased from about USD300 000 in 2004 to about USD7 million in 2006. These figures show how under-resourced the agency was originally. The improved budget situation led to the agency making substantial contributions to the state budget: in 2006 it paid USD1 million in Value Added Tax, USD600 000 in social tax and USD350 000 in income tax. These amounts far exceeded the budget that the state provided to the agency prior to the reform. One of the hardest aspects of the reform was cutting the staff posts, but that was necessary because the original over-staffed agency was neither efficient nor effective’. The Voluntary Guidelines on the Governance of Tenure of Land, Fisheries and Forests in the Context of National Food Security. Adopted in 2012, this is the most recognised international standard on land governance. The guidelines cover the full spectrum of governance issues in the sector, from legal recognition and allocation of tenure rights to administration of tenure and responses to climate change and emergencies. There also a number of direct references to countering corruption, chiefly article 6.9 which notes that: ‘States and non-state actors should endeavour to prevent corruption with regard to tenure rights. States should do so particularly through consultation and participation, rule of law, transparency and accountability. States should adopt and enforce anti-corruption measures including applying checks and balances, limiting the arbitrary use of power, addressing conflicts of interest and adopting clear rules and regulations. States should provide for the administrative and/or judicial review of decisions of implementing agencies. Staff working on the administration of tenure should be held accountable for their actions. They should be provided with the means of conducting their duties effectively. They should be protected against interference in their duties and from retaliation for reporting acts of corruption’. The World Bank Land Governance Assessment Framework similarly provides a broad set of standards against which to assess governance of a land sector. It is constructed around nine categories of indicators which are scored by assessors and can be used to identify gaps in a country’s land governance framework. Scorecards are available here. Links to these publications and all other sources cited in the review can be found in the bibliography.